We understand the importance of having your elderly loved ones cared for, especially when you are not able to be home to look out for them daily. Let us help ease your concerns with our adult day care service. 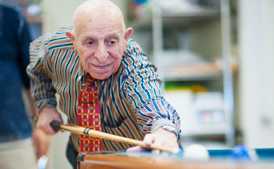 Our program promotes socialization and physical wellness by offering seniors the opportunity to socialize, participate in a variety of events and pass the day, all within a safe environment. We have a nurse and therapist on staff every day to assist with the needs of your loved one while in our care. We provide therapeutic activities that include arts and crafts, games to aid in maintaining mental function and group exercise. Our staff monitors the care and safety of participants so that they get the most out of day-to-day living. We have an onsite kitchen and staff who prepare fresh meals daily to take care of the nutritional needs of our daycare participants. Capacity is limited to 50. Call us today at 314-726-5600 to inquire about availability. AW Adult Day Center is a 50 people capacity day program that provides care & supervision, monitoring of general health, social interaction and peer contact for physically impaired or socially isolated patients in a friendly and safe environment. Nursing, social services, activities and dietary services are provided within the context of the program.